Distinguishing decreased uroflow caused by anterior and posterior urethral obstruction can be difficult, particularly in older patients who have had a urethroplasty and require surveillance for recurrence. We hypothesize that changes in maximum uroflow (Qmax) with Valsalva Voiding (VV) and Non-Valsalva Voiding (NVV) can distinguish decreased uroflow caused by anterior urethral stricture (US) from prostatic obstruction (PO) because those with PO will not have an increase in uroflow while those with US will have an increase. A prospective IRB approved study of a consecutive series of men presenting to a tertiary care urology clinic was conducted. Subjects were divided into three groups based on clinical and cystoscopic information: group 1 (US), group 2 (PO), and a control group (group 3) with no obstruction. Maximum flow rate (Qmax) was measured, one VV and one NVV, without intervening treatment or cystoscopy within a two week period. Patients with voided volumes less than 150ml on either VV or NVV were excluded. In each patient, the difference in maximum flow rate (Qmax) between VV and NVV was calculated and a student T-test was used to assess statistical difference. 113 individuals were evaluated. 26 were excluded due to voided volume < 150 ml (6 in group 1, 11 in group 2 and 9 in group 3). Mean age was 54 years (range 23-83). The table (left) depicts changes in Qmax between VV & NVV for each group. P values compare differences between VV & NVV. These data suggest that VV is a useful non-invasive test that distinguishes PO from US. 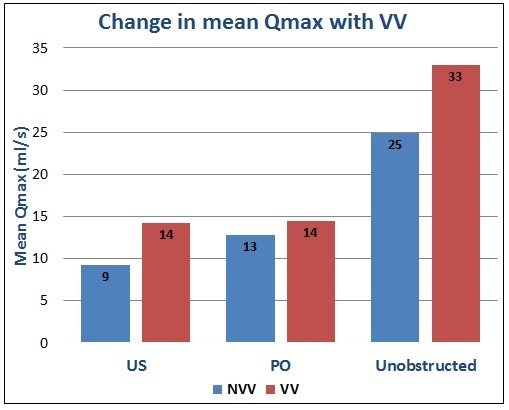 Patients with prostatic obstruction do not have any increase in Qmax with VV whereas those with US have slight increases and normal unobstructed individuals have large increases. Valsalva voiding can be used as a means to distinguish patients with anterior and posterior urethral obstruction. We evaluated consecutive video-recorded cystoscopies of men who had more than one cystoscopy between 2002 and 2014 and were diagnosed with a stage 1 US. Indication for cystoscopy was recorded and changes in stricture staging over time was assessed. Exclusion criteria included: intermittent catheterization and/or surgical intervention. The optimal treatment of Overactive Bladder (OAB) symptoms in men with obstruction is controversial. Most data concerns OAB in patients with bladder outlet obstruction (BOO) secondary to prostatic enlargement, while little data exists for OAB in patients with BOO secondary to urethral stricture disease. We present our data on change in OAB symptoms after correction of BOO from anterior urethroplasty. This is a prospective study of men who underwent urethral reconstruction between 2010 and 2012 who also suffered from OAB symptoms. All men had diagnosed obstruction based on clinical and urodynamic criteria. OAB was defined as a score >8 on the Overactive Bladder Symptom Subscore (OABSS). Preoperatively, all patients were assessed by history and exam, urinalysis and culture, uroflow (Q) and residual urine (PVR), cystoscopy, retrograde urethrogram, The Lower Urinary Tract Symptom Score (LUTSS) and OABSS. Postoperatively, patients were evaluated by Q, PVR, and voiding cystourethrogram (VCUG) at time of catheter removal. Patients also filled out the LUTSS and OABSS at least 2 months postoperatively. The primary outcome measure was the change in the OABSS after surgery. Nineteen men aged 34 to 89 (mean: 61), who had clinical OAB by OABSS criteria, underwent urethroplasty. One patient was excluded because of a second anterior stricture that required operation. Mean preoperative OABSS was 16.1 (median: 14.5, range: 8-26). This decreased to a mean OABSS of 6.7 (median: 7, range: 2-12). 9/18 (50%) men had OABSS <8, 4/18 (22%) OABSS =8, and 5/18 (28%) had an OABSS >8. All patients had a decline in OABSS. In all patients, urethroplasty improved OAB symptoms. Half of the cohort of patients had no OAB postoperatively, at all. This study demonstrates that in patients with OAB and urethral obstruction, cure of urethral obstruction will correct OAB symptoms. Introduction: Currently there is no widely accepted staging system for anterior urethral strictures. We developed and evaluated the reliability of an easy to use classification system for anterior urethral strictures in men. 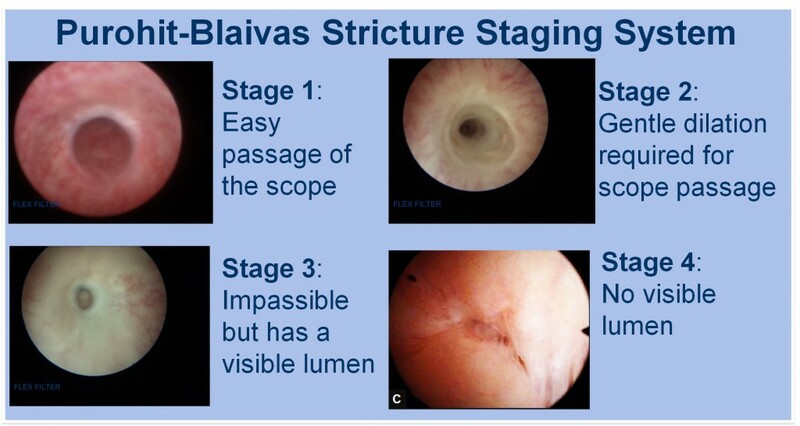 Methods: We devised a staging system based on cystoscopic findings of no stricture (stage 0), wide caliber stricture (stage 1), stricture requires gentle dilation with a 16Fr flexible cystoscope (stage 2), stricture cannot be dilated (stage 3) and no visible lumen (stage 4). Content validity was established by a panel of 5 urologists. On 2 separate occasions 3 urologists independently viewed videos obtained during cystoscopy and staged the tightest visible stricture. If multiple strictures were present, the stricture with the smallest visible lumen was used for the purpose of this study. All men who had undergone cystoscopy at our institution between 2011 and 2012 were included in the study. Exclusion criteria were poor video quality and not visualizing the entire urethra during cystoscopy. Results: A total of 101 videos of consecutive cystoscopies were reviewed. Intra-observer agreement was 76% to 94% (Cohen k 0.65e0.90) and interobserver agreement was 73% to 82% (Cohen k 0.51e1.00, 0.69 overall, p <0.001). The intra-observer and interobserver agreement increased for each stage, with 3 and 4 almost unanimously identified by all 3 observers (Cohen k 0.93 and 1.00, p <0.001). Conclusions: This new staging system is simple and easy to use, and has excellent intra-observer and good interobserver reliability. The staging system provides a simple lexicon for describing the appearance of anteriorurethral strictures. The rate of visits to physician offices for urethral stricture disease in men ranges from 229 to 312/100,000 visits. Classification systems exist for anterior and posterior urethral trauma and for urethral cancer but no commonly accepted staging system currently exists for anterior urethral strictures. The absence of a staging system limits precision and concision in clinical discussions describing urethral strictures due to the lack of a common lexicon. Strictures can be subjectively described as dense, complete, partial, wide caliber or pinpoint tight. Although descriptions can be helpful, they may not be systematically reproducible among practitioners. Currently, strictures are effectively staged with an ad hoc binary classification system in practice and in the literature with patients described as either having a stricture or not. We believe it would be more appropriate and more useful to describe strictures in a graded or staged fashion, particularly for general urologists making referrals for patients with stricture. Furthermore, comparing surgical outcomes for strictures is difficult without a common staging system. The use of nonstandardized outcome measures likely has a significant impact on the reported success of procedures to treat urethral strictures. 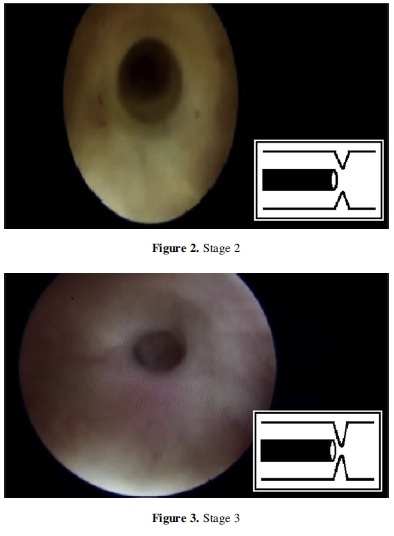 Webster et al believed the 3 important factors to describe a stricture were lumen size, location (anterior or posterior) and length.6 We evaluated the reliability of a new, simple and easy to use classification system for anterior urethral strictures which currently involves only flexible cystoscopy to assess lumen size. Other aspects of the anterior stricture, including retrograde urethrogram results, length and number, as well as the amount of spongiofibrosis will be incorporated into a more detailed classification scheme in the future. We performed a prospective, blinded study of interuser and intra-user reliability for a staging system of anterior urethral stricture disease in men. The staging system was devised by 2 of us (RSP and JGB) based on clinical experience with this entity. Content validity was established by a panel of 5 urologists, including a senior urology resident, a general urologist and 3 voiding dysfunction specialists, 2 of whom are reconstructive surgeons. All men who underwent cystoscopy at our institution between 2011 and 2012 were included in the study. We evaluated the recorded videos of routine flexible cystoscopy of consecutive men with voiding complaints or hematuria, or who were undergoing bladder cancer surveillance. Exclusion criteria were poor video quality and inability to visualize the urethra distal to the stricture. On 2 separate occasions at least 1 month apart, 3 urologists, in the presence of a nonurologist researcher, independently viewed a video of the entire urethra obtained during diagnostic cystoscopy. The urologists were blinded to the patient and to the results of prior assessments of each patient. Video recorded flexible cystoscopy with a Stryker 16Fr flexible cystoscope is a standard part of our practice. 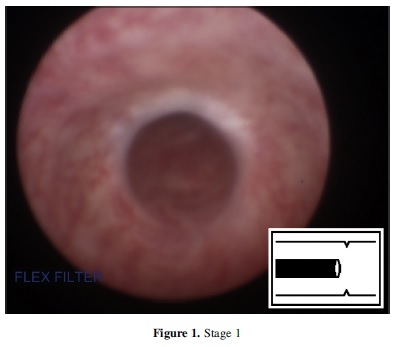 The urethra was classified as stage 0dno stricture, stage 1dwide caliber stricture that easily allows scope passage, stage 2dpassable stricture but requires gentle dilation with a 16Fr flexible cystoscope, stage 3dimpassable stricture with scope but lumen visible and stage 4dstricture with no visible lumen (figs. 1 to 4). If there were multiple strictures, the stricture with the smallest visible lumen was evaluated for the study. Spongiofibrosis, retrograde urethrogram results and multiple strictures are not included in this initial version of the staging system. Intra-observer and interobserver reliability was calculated with unweighted Cohen k, a measure of reliability. Reliability was calculated to measure differences within and between observers. A k of 0.81e0.99 is interpreted as almost perfect, 0.61e0.80 substantial, 0.41e0.60 moderate, 0.21e0.40 fair and below 0.20 poor agreement.7 This project was reviewed by the Cornell University internal review board. Videos of 108 consecutive cystoscopies in men were reviewed by the researcher. Five videos were excluded from study because the entire urethra was not visualized during cystoscopy and 2 were excluded because of poor video quality, leaving 101 cystoscopies for staging. Indications for cystoscopy included recurrent urinary tract infection in 3 cases, lower urinary tract symptoms in 66, hematuria in 16 and bladder cancer surveillance in 16. There was either a suspicion or known history of urethral stricture in 20 cases. The distribution of staging was stage 0 in 36 to 52 cases, stage 1 in 15 to 34, stage 2 in 7 to 12, stage 3 in 19 to 20 and stage 4 in 1. Counts are different because strictures were graded differently. Intra-observer agreement was 76% to 94% (Kappa 0.65 to 0.90) (table 1). Most disagreements were between stages 0 and 1 or stages 1 and 2. Interobserver agreement was 73% to 82% (Kappa 0.51 to 1.00, 0.69 overall. p <0.001, table 2). Most importantly, the intra-observer and interobserver agreement increased for each stage, and stages 3 and 4 were almost unanimously identified by all 3 observers (Kappa 0.93 and 1.00, p <0.001). This new staging system for anterior urethral strictures is easy to use, and has high intra-observer and interobserver reliability. We believe that it offers substantial advantages over a purely descriptive terminology. It is reproducible, does not add any time to cystoscopy, requires no additional equipment and can aid in communication among practitioners. This system is meant for use by general urologists to aid in providing a common lexicon when considering referral for complex stricture repair. Currently, it is not useful for determining the type of urethroplasty repair and retrograde urethrography is still required in that decision making process. A more complex staging system is being developed for use by stricture specialists which will incorporate other stricture components. We evaluated the reliability of a novel staging system structured only on simple findings at cystoscopy. We chose cystoscopy because it is performed in the office by most general urologists and reconstructive specialists, and is already commonly used to diagnose primary and secondary strictures.A voiding cystourethrogram, retrograde urethrogram and urethral calibration were considered part of this staging system but were not incorporated because these techniques are not readily available to all general urologists, are difficult to standardize and the quality of the study is operator dependent. For example, retrograde urethrography can be challenging for a general urologist to perform in the office because fluoroscopy is often not available and when it is, the degree of urethral foreshortening can be difficult to calculate.9 The reliance on cystoscopy alone allows this staging system to be used by all urologists as well as any physician who may have access to a cystoscope. Controversy exists in the current literature on how to define success after urethral reconstruction.8,10 While this system does not help determine the type of surgical repair needed, it may help elucidate outcomes and clarify definitions of success. For example, a stage 3 stricture treated with urethroplasty may become a stage 0 or 1 stricture. Because stage 0 and 1 strictures may not affect flow rate, many reconstructive surgeons would consider both outcomes a success. However, a stage 1 stricture may have a higher chance of failure and, therefore, may require closer monitoring. Additionally, for general urologists more accustomed to dilations and urethrotomy, the staging system may better qualify the need for surgery and the likelihood of success. This simple cystoscopic system provides a common lexicon for outcomes research among different treatments for stricture disease. Such a lexicon can provide guidance as to when a nonstricture surgeon should consider a referral to a stricture specialist. Furthermore, staging of strictures may permit more accurate correlations of gradations of strictures to severity of symptoms and outcomes. Such correlations may help elucidate effective treatment strategies for specific symptoms of anterior stricture disease as well as help identify outcome differences between tertiary referral centers and urologists who may infrequently treat strictures. The application and relationship of this system to symptoms, type of repair used and surgical outcomes will be part of future evaluations. A few points of clarification for this staging system are necessary. This staging system does not describe the entire urethra but rather each individual stricture. We validated the staging system by looking at the tightest visible distal stricture on digitally recorded cystoscopy. Nonetheless, the system is applicable for any discrete stricture in the urethra. For example, an individual patient may have multiple stage 1 pendulous urethral strictures and a stage 3 bulbar urethra. 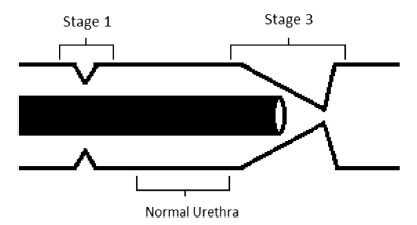 Each individual stricture must be separated by normal (stage 0) urethra. A long stricture is defined by the highest stage of stricture (fig. 5). The staging system may clarify why strictures become symptomatic. For example, we believe that there is likely a subgroup of men with stage 3 strictures with no urinary symptoms despite this apparently high grade anatomical urethral obstruction. Identification of stricture subtypes may be a first step in better clarifying the role and extent of anatomical obstruction for the development of symptoms in stricture disease. Figure 5. Stage 1 stricture distal to stage 3 stricture. Strictures are staged independently because they are separated by normal urethra. For validation purposes, this urethra would be graded as stage 3 stricture. The use of this staging system may help better elucidate the natural history of urethral strictures. For example, it is not clear to us the likelihood of stage 1 strictures progressing to stage 3 or 4 strictures. Clinicians are often confronted with incidentally discovered wide caliber (ie stage 1) primary strictures and may have difficulty counseling these patients as to the need for followup or the likelihood of problems developing. The classification scheme presents a framework for research charting the progression of these strictures and could define whether there is a pattern as well as the time to such progression. It would be informative for physicians and crucial for patients to be able to determine whether symptoms worsen even when a stricture does not progress to a higher stage. The staging system described is reliable and the results of its validation make sense intuitively, as reliability was lower in identifying low grade strictures because these are somewhat ambiguous and likely clinically similar. Specifically, stage 1 and 2 strictures were less accurately classified than stage 3 and 4 strictures. We believe the reason for this discrepancy is that we used videos of cystoscopies rather than live, witnessed cystoscopies, and thus cystoscopic haptic feedback is difficult if not impossible watching videos. The reliability of stage 0 to 2 strictures would likely be higher with real-time cystoscopy. The stages that describe strictures that typically require treatment did in fact have exceptional reliability. All 3 observers, including the generalist, scored fairly high using this classification system. Therefore, physicians who do not typically specialize in strictures would know that a stage 3 or 4 stricture should be referred to a specialist. An additional weakness of our study is that we used a Stryker flexible cystoscope. Although technology may change and others may use different equipment, we do not expect such changes would be enough to preclude the relevance of the rough estimation of stricture caliber provided by cystoscopy. The staging system is not applicable when a rigid cystoscope is used. It primarily focuses on lumenal narrowing, does not assess the extent of spongiofibrosis, the amount of which may better determine stricture progression, and does not yet incorporate voiding symptoms or flow rates. The staging system does not evaluate multiple stage 3 or 4 strictures but only the first stage 3 stricture encountered (ie the most distal) is identified. However, despite these limitations, we believe a simple staged approach to stricture disease is superior to the currently used ad hoc binary system (stricture present or absent). It is important to recognize that this staging system describes each individual stricture and not the entire urethra. For example, a patient can have multiple, different stage strictures in different locations of the urethra. Future directions are to expand the system to include the entire urethra with a system that might involve something analogous to the TNM staging system used in oncology.11 Findings such as degree of spongiofibrosis, number and length of strictures, and symptoms will be evaluated for inclusion in the more complex system. Future research may include examining the correlation between flow rates and stages to determine whether such exclusion limits the use of the staging system. We anticipate additional development of the staging system to better aid stricture specialists in identifying what the most efficacious procedure is for particular symptoms. We describe a new staging system that is simple and easy to use, and has excellent intra-observer and interobserver reliability. Reliability for stage 3 and 4 strictures, which usually require treatment, was nearly unanimous. This staging system may help guide clinical decision making for general urologists confronted with a urethral stricture, and provide a common lexicon for clinical and academic discussion of strictures. For stricture specialists, future directions are to provide a staging modification that may include stricture location, number and length analogous to the TNM staging system. 1. Santucci RA, Joyce GF and Wise M: Male urethral stricture disease. J Urol 2007; 177: 1667. 2. Colapinto V and McCallum RW: Injury to the male posterior urethra in fractured pelvis: a new classification. J Urol 1977; 118: 575. 3. Goldman SM, Sandler CM, Corriere JN Jr et al: Blunt urethral trauma: a unified, anatomical mechanical classification. J Urol 1997; 157: 85. 4. Armenakas NA and McAninch JW: Acute anterior urethral injuries: diagnosis and intial management. In: Traumatic and Reconstructive Urology. Edited by JW McAninch. Philadelphia: WB Saunders 1996, pp 543e550. 5. Mundy AR and Andrich DE: Urethral strictures. BJU Int 2011; 107: 6. 6. Webster GD, Koefoot RB and Sihelnik SA: Urethroplasty management in 100 cases of urethral stricture: a rationale for procedure selection. J Urol 1985; 134: 892. 7. Landis JR and Koch GG: The measurement of observer agreement for categorical data. Biometrics 1977; 33: 159. 8. Meeks JJ, Erickson BA, Granieri MA et al: Stricture recurrence after urethroplasty: a systematic review. J Urol 2009; 182: 1266. 9. Morey AF and McAninch JW: Role of preoperative sonourethrography in bulbar urethral reconstruction. J Urol 1997; 158: 1376. 10. Voelzke BB: Critical review of existing patient reported outcome measures after male anterior urethroplasty. J Urol 2013; 189: 182. 11. Edge SB, Byrd DR, Compton CC et al: AJCC Cancer Staging Manual, 7th ed. New York: Springer 2010. There has been a movement in recent years to standardize preoperative and postoperative evaluations for anterior urethral stricture disease (reference 8 in article). This study by Purohit et al represents an initial effort to begin to standardize stricture classification. The authors evaluate interuser and intra-user reliability for their novel staging system for anterior urethral stricture using only flexible cystoscopy, and conclude that this simple system was reasonably reliable, especially for more significant luminal narrowing. It remains to be seen if this most basic method of staging augments the ability of the general urologist to determine whether a patient requires referral to a specialist. More likely, this type of staging will be useful as an adjunct to patient centered outcomes analysis before and after urethral reconstruction. As the authors recognize, their study is significantly limited as they only assess the most proximal stricture visible and do not consider imaging studies, length of stricture or degree of spongiofibrosis, uroflometry or subjective symptoms, all known to affect urethral reconstruction outcome. An ideal classification system would ultimately incorporate multiple variables, drawing a clinical correlation between quantitative data and patient perception of symptoms. 1. DeLong J and Buckley J: Patient-reported outcomes combined with objective data to evaluate outcomes after urethral reconstruction. Urology 2013; 81: 432. We appreciate the thoughtful comments. We believe this rudimentary staging system will be a useful lexicon for communication about the most overt characteristic of a stricture, which is the degree of luminal narrowing. For example, most urologists have encountered incidental wide caliber circumferential urethral strictures that offer no resistance to cystoscope passage and alternatively have seen those that are impassable. Currently, there is no classification system to differentiate them but in our staging system they are stage 1 and 3, respectively. To clarify, this system evaluates all strictures distal to stage 3 and not just the most distal, and each individual stricture is staged rather than the entire urethra. In its current state we believe this system is also useful for clinical research. For example, we are in the midst of a study analyzing the evolution of strictures, which is impossible with the current de facto binary system (present or not). We agree that our staging system is incomplete and needs to incorporate additional elements, including stricture length, multiplicity and degree of spongiofibrosis. However, this is an anatomical not functional staging system. While uroflowmetry, residual urine and subjective symptoms are important metrics for outcomes assessment, we do not think they should be part of an anatomical classification system.